A United States Treasury security is a government debt instrument issued by the United States Department of the Treasury to finance government spending as an alternative to taxation. Treasury securities are often referred to simply as Treasuries. Since 2012 the management of government debt has been arranged by the Bureau of the Fiscal Service, succeeding the Bureau of the Public Debt. There are four types of marketable treasury securities: Treasury bills, Treasury notes, Treasury bonds, and Treasury Inflation Protected Securities (TIPS). There are also several types of non-marketable treasury securities including State and Local Government Series (SLGS), Government Account Series debt issued to government-managed trust funds, and savings bonds. All of the marketable Treasury securities are very liquid and are heavily traded on the secondary market. The non-marketable securities (such as savings bonds) are issued to subscribers and cannot be transferred through market sales. Federal Reserve Banks are required to hold collateral equal in value to the Federal Reserve notes that the Federal Reserve Bank puts into circulation. This collateral is chiefly held in the form of U.S. Treasury debt and government-sponsored enterprise securities. To finance the costs of World War I, the U.S. Government increased income taxes (see the War Revenue Act of 1917) and government debt, called war bonds. Traditionally, the government borrowed from other countries, but there were no other countries from which to borrow in 1917. The Treasury raised funding throughout the war by selling $21.5 billion in 'Liberty bonds.' These bonds were sold at subscription where officials created coupon price and then sold it at par value. At this price, subscriptions could be filled in as little as one day, but usually remained open for several weeks, depending on demand for the bond. After the war, the Liberty bonds were reaching maturity, but the Treasury was unable to pay each down fully with only limited budget surpluses. The resolution to this problem was to refinance the debt with variable short and medium-term maturities. Again the Treasury issued debt through fixed-price subscription, where both the coupon and the price of the debt were dictated by the Treasury. The problems with debt issuance became apparent in the late 1920s. The system suffered from chronic over-subscription, where interest rates were so attractive that there were more purchasers of debt than supplied by the government. This indicated that the government was paying too much for debt. As government debt was undervalued, debt purchasers could buy from the government and immediately sell to another market participant at a higher price. In 1929, the US Treasury shifted from the fixed-price subscription system to a system of auctioning where 'Treasury Bills' would be sold to the highest bidder. Securities were then issued on a pro rata system where securities would be allocated to the highest bidder until their demand was full. If more treasuries were supplied by the government, they would then be allocated to the next highest bidder. This system allowed the market, rather than the government, to set the price. On December 10, 1929, the Treasury issued its first auction. The result was the issuing of $224 million three-month bills. The highest bid was at 99.310 with the lowest bid accepted at 99.152. "Treasury bill" redirects here. Note that the Bank of England issues these in the United Kingdom. Treasury bills (or T-bills) mature in one year or less. Like zero-coupon bonds, they do not pay interest prior to maturity; instead they are sold at a discount of the par value to create a positive yield to maturity. Regular weekly T-Bills are commonly issued with maturity dates of 28 days (or 4 weeks, about a month), 91 days (or 13 weeks, about 3 months), 182 days (or 26 weeks, about 6 months), and 364 days (or 52 weeks, about 1 year). Treasury bills are sold by single-price auctions held weekly. Offering amounts for 13-week and 26-week bills are announced each Thursday for auction, usually at 11:30 a.m., on the following Monday and settlement, or issuance, on Thursday. Offering amounts for 4-week bills are announced on Monday for auction the next day, Tuesday, usually at 11:30 a.m., and issuance on Thursday. Offering amounts for 52-week bills are announced every fourth Thursday for auction the next Tuesday, usually at 11:30 am, and issuance on Thursday. Purchase orders at TreasuryDirect must be entered before 11:00 on the Monday of the auction. The minimum purchase, effective April 7, 2008, is $100. (This amount formerly had been $1,000.) Mature T-bills are also redeemed on each Thursday. Banks and financial institutions, especially primary dealers, are the largest purchasers of T-bills. Like other securities, individual issues of T-bills are identified with a unique CUSIP number. The 13-week bill issued three months after a 26-week bill is considered a re-opening of the 26-week bill and is given the same CUSIP number. The 4-week bill issued two months after that and maturing on the same day is also considered a re-opening of the 26-week bill and shares the same CUSIP number. For example, the 26-week bill issued on March 22, 2007, and maturing on September 20, 2007, has the same CUSIP number (912795A27) as the 13-week bill issued on June 21, 2007, and maturing on September 20, 2007, and as the 4-week bill issued on August 23, 2007 that matures on September 20, 2007. During periods when Treasury cash balances are particularly low, the Treasury may sell cash management bills (or CMBs). These are sold at a discount and by auction just like weekly Treasury bills. They differ in that they are irregular in amount, term (often less than 21 days), and day of the week for auction, issuance, and maturity. When CMBs mature on the same day as a regular weekly bill, usually Thursday, they are said to be on-cycle. The CMB is considered another reopening of the bill and has the same CUSIP. When CMBs mature on any other day, they are off-cycle and have a different CUSIP number. This is the modern usage of Treasury note in the U.S.; for the earlier meanings, see Treasury Note (disambiguation). 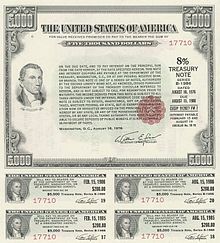 Treasury notes (or T-notes) mature in two to ten years, have a coupon payment every six months, and have denominations of $1,000. In the basic transaction, one buys a $1,000 T-note for $950, collects interest of 3% per year over 10 years, which comes to $30 yearly, and at the end of the 10 years cashes it in for $1000. So, $950 over the course of 10 years becomes $1300. T-notes and T-bonds are quoted on the secondary market at percentage of par in thirty-seconds of a point (n/32 of a point, for n = 1, 2, 3, …). Thus, for example, a quote of 95:07 on a note indicates that it is trading at a discount: $952.22 (i.e., 95 + 7/32%) for a $1,000 bond. (Several different notations may be used for bond price quotes. The example of 95 and 7/32 points may be written as 95:07, or 95-07, or 95'07, or decimalized as 95.21875.) Other notation includes a +, which indicates 1/64 points and a third digit may be specified to represent 1/256 points. Examples include 95:07+ which equates to (95 + 7/32 + 1/64) and 95:073 which equates to (95 + 7/32 + 3/256). Notation such as 95:073+ is not typically used. The 10-year Treasury note has become the security most frequently quoted when discussing the performance of the U.S. government bond market and is used to convey the market's take on longer-term macroeconomic expectations. "U.S. Bonds" redirects here. For the singer/performer, see Gary U.S. Bonds. Treasury bonds (T-Bonds, or the long bond) have the longest maturity, from twenty years to thirty years. They have a coupon payment every six months like T-Notes, and are commonly issued with maturity of thirty years. The U.S. Federal government suspended issuing 30-year Treasury bonds for four years from February 18, 2002 to February 9, 2006. As the U.S. government used budget surpluses to pay down Federal debt in the late 1990s, the 10-year Treasury note began to replace the 30-year Treasury bond as the general, most-followed metric of the U.S. bond market. However, because of demand from pension funds and large, long-term institutional investors, along with a need to diversify the Treasury's liabilities—and also because the flatter yield curve meant that the opportunity cost of selling long-dated debt had dropped—the 30-year Treasury bond was re-introduced in February 2006 and is now issued quarterly. Treasury Inflation-Protected Securities (or TIPS) are the inflation-indexed bonds issued by the U.S. Treasury. The principal is adjusted to the Consumer Price Index (CPI), the commonly used measure of inflation. When the CPI rises, the principal adjusts upward. If the index falls, the principal adjusts downwards. The coupon rate is constant, but generates a different amount of interest when multiplied by the inflation-adjusted principal, thus protecting the holder against the official inflation rate (as asserted by the CPI). TIPS were introduced in 1997. TIPS are currently offered in 5-year, 10-year and 30-year maturities. Separate Trading of Registered Interest and Principal Securities (or STRIPS) are T-Notes, T-Bonds and TIPS whose interest and principal portions of the security have been separated, or "stripped"; these may then be sold separately (in units of $100 face value) in the secondary market. 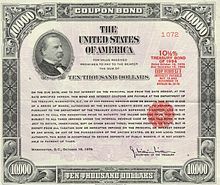 The name derives from the days before computerization, when paper bonds were physically traded; traders would literally tear the interest coupons off of paper securities for separate resale. The government does not directly issue STRIPS; they are formed by investment banks or brokerage firms, but the government does register STRIPS in its book-entry system. STRIPS must be purchased through a broker, and cannot be purchased from TreasuryDirect. STRIPS are used by the Treasury and split into individual principal and interest payments, which get resold in the form of zero-coupon bonds. Because they then pay no interest, there is not any interest to re-invest, and so there is no reinvestment risk with STRIPS. The "Certificate of Indebtedness" (C of I) is a Treasury security that does not earn any interest and has no fixed maturity. It can only be held in a TreasuryDirect account and bought or sold directly through the Treasury. It is intended to be used as a source of funds for traditional Treasury security purchases. Purchases and redemptions can be made at any time. Government Account Series Treasurys (GAS) are the principal form of intragovernmental debt holdings. Savings bonds were created in 1935, and, in the form of Series E bonds, also known as war bonds, were widely sold to finance World War II. Unlike Treasury Bonds, they are not marketable, being redeemable only by the original purchaser (or beneficiary in case of death). They remained popular after the end of WWII, often used for personal savings and given as gifts. In 2002, the Treasury Department started changing the savings bond program by lowering interest rates and closing its marketing offices. As of January 1, 2012, financial institutions no longer sell paper savings bonds. Savings bonds are currently offered in two forms. Series EE bonds, which pay a fixed rate but are guaranteed to pay at least double the purchase price when they reach initial maturity at 20 years. Series I bonds have a variable interest rate that consists of two components. The first is a fixed rate which will remain constant over the life of the bond; the second component is a variable rate reset every six months from the time the bond is purchased based on the current inflation rate as measured by the Consumer Price Index (CPI-U) from a six-month period ending one month prior to the reset time. New rates are published on May 1 and November 1 of every year. During times of deflation the negative inflation rate can wipe out the return of the fixed portion, but the combined rate cannot go below 0% and the bond will not lose value. Series I bonds are the only ones offered as paper bonds since 2011, and those may only be purchased by using a portion of a federal income tax refund. For the quantitative easing policy, the Federal Reserve holdings of U.S. Treasuries increased from $750 billion in 2007 to over $1.7 trillion as of end-March 2013. On September 13, 2012, in an 11-to-1 vote, the Federal Reserve announced they were also buying $45 billion in long-term Treasuries each month on top of the $40 billion a month in mortgage-backed securities. The program is called QE3 because it is the Fed's third try at quantitative easing. The result is that an enormous proportion of the US debt is actually owed from the Treasury to the Federal Reserve; according to a 1947 law, the Federal Reserve must return this money to the Treasury each year, after expenses. After the Federal Reserve buys Treasury securities on the open market as part of the QE program (as it is prohibited from buying them directly from the US Treasury at auction), the Federal Reserve receives its interest thereafter, instead of the private sector seller. The amount of that interest payment is thereby removed from the economy. In 2012, the Federal Reserve collected nearly $82 billion in interest profit from its treasury securities purchases. (Page 302 of the 2013 "100th Annual Report") After expenses (district Federal Reserve property taxes, salaries, facilities management, dividends, etc. ), it returns all money to the US Treasury. ^ "Is U.S. currency still backed by gold?" ^ a b c d e Kenneth D. Garbade (July 2008). "Why The U.S. Treasury Began Auctioning Treasury Bills in 1929" (PDF). Federal Reserve Bank of New York, Vol. 14, No. 1. Retrieved April 27, 2011. ^ Treasury Bills, TreasuryDirect.gov. U.S. Department of Treasury, Bureau of Public Debt. April 22, 2011. Retrieved May 24, 2011. ^ "Treasury Reintroduces 30-Year Bond". U.S. Federal Reserve. April 13, 2011. Retrieved August 22, 2012. ^ "The United States on Track to Pay Off the Debt by End of the Decade". Clinton4nara.gov. December 28, 2000. Archived from the original on June 1, 2010. Retrieved October 23, 2009. ^ "Table of Treasury Securities". U.S. Department of the Treasury. November 4, 2010. Retrieved April 27, 2011. ^ Benjamin Shephard (July 9, 2008). "Park Your Cash". InvestingDaily.com. Retrieved May 17, 2011. ^ "Individual - Treasury Inflation-Protected Securities (TIPS)". ^ "Treasury Inflation-Protected Securities(TIPS)". TreasuryDirect.gov. April 7, 2011. Retrieved April 27, 2011. ^ "Regulations Governing Treasury Securities, New Treasury Direct System" (PDF). U.S. Department of the Treasury. Bureau of the Public Debt, Fiscal Service, Treasury, Vol. 69, No. 157. August 2004. Retrieved May 17, 2011. ^ "Monthly Statement of the Public Debt of the United States" (PDF). treasurydirect.gov. September 30, 2009. Retrieved November 4, 2009. ^ Pender, Kathleen (December 3, 2007). "Treasury takes new whack at savings bonds". The San Francisco Chronicle. Hearst. Retrieved February 14, 2007. ^ Pender, Kathleen (July 13, 2011). "Treasury takes new whack at savings bonds". Treasury Department News Release. Treasury. Retrieved November 25, 2011. ^ "Series EE/E Savings Bond Rates". U.S. Department of the Treasury. Retrieved July 19, 2008. ^ a b "I Savings Bonds Rates & Terms". TreasuryDirect.gov. November 1, 2015. Retrieved June 6, 2017. ^ "Use Your Federal Tax Refund to Buy Savings Bonds". irs.gov. February 1, 2011. Retrieved April 27, 2011. ^ a b 100th Annual Report 2013 (PDF). Board of Governors of the Federal Reserve System. 2013. ^ "Foreign Portfolio Holdings of U.S. Securities as of 6/30/2017" (PDF). U.S. Department of the Treasury. April 30, 2018. ^ "Foreign Portfolio Holdings of U.S. Securities as of 6/30/2016" (PDF). U.S. Department of the Treasury. April 28, 2017. U.S. Bureau of the Public Debt: Series A, B, C, D, E, F, G, H, J, and K Savings Bonds and Savings Notes.